Gas. It may be an embarrassing subject, but we all have suffered from it at one time or another. It may have even happened to you in a time when you wished to have been anywhere else but in the company of strangers or friends. For me, it has hit more times than I can count and at the worst possible times. You get the picture. I seem to be hit with Murphy’s law quite a bit. If I really don’t want gas to hit, it does! Ugh! I have a sensitive stomach and really have to watch what I eat or else I’ll pay for it later. If I’m nervous or anxious, my stomach starts to hurt. These are the times when you really don’t want gas pain to strike. It just adds to the anxiety and makes me not want to go anywhere! I’ve been coping by not eating my trigger foods. However, my list of trigger foods is quite lengthy so sometimes I’ll just wait till I get home to eat anything! One of the worst trigger foods for me is lentils. Yes, they are very healthy with loads of fiber, protein and vitamins, BUT that comes with some major side effects for me….gas and bloating. John won’t sleep in the same room with me after we’ve had lentils for supper and has forbid me to ever eat them again. 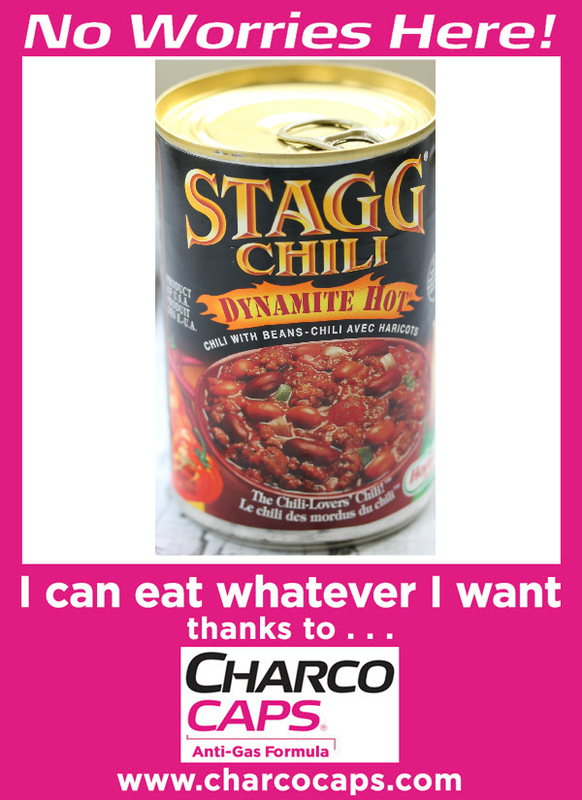 Another favourite of mine is chili, either homemade in the slowcooker or canned chili for a quick lunch. Chili is a notorious for causing smelly gas and I’m sure it’s on many people’s lists. It’s the beans and all the spices that really do a number on my body. If I eat chili, I have to make sure no one is coming over and I don’t have anywhere to go for at least a few hours. My next trigger may come as a surprise to some….macaroni and cheese. It’s the combination of the pasta (starch) + dairy. My body has trouble digesting the two together and it leads to silent (and deadly) consequences. 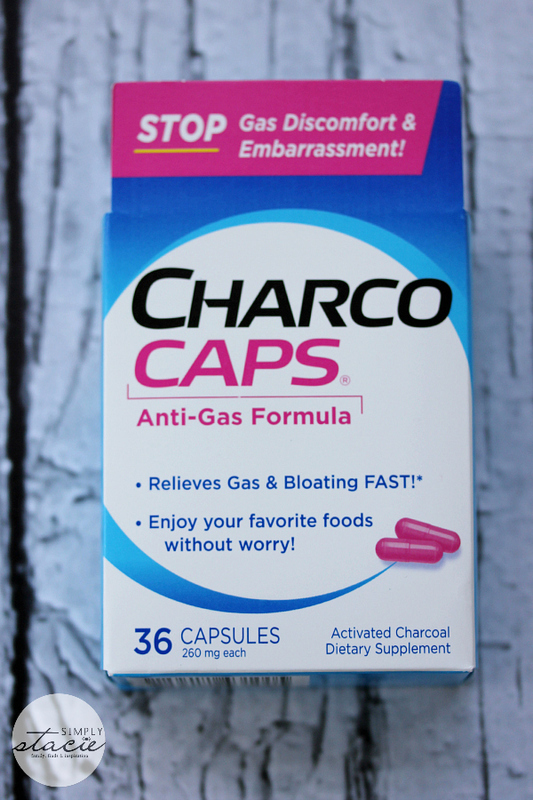 I recently had the opportunity to try out CharcoCaps® Anti-Gas Formula, a safe, naturally gentle dietary supplement that adsorbs and eliminates intestinal gas and bloating. Its main ingredient is activated charcoal which is known for its adsorption properties. 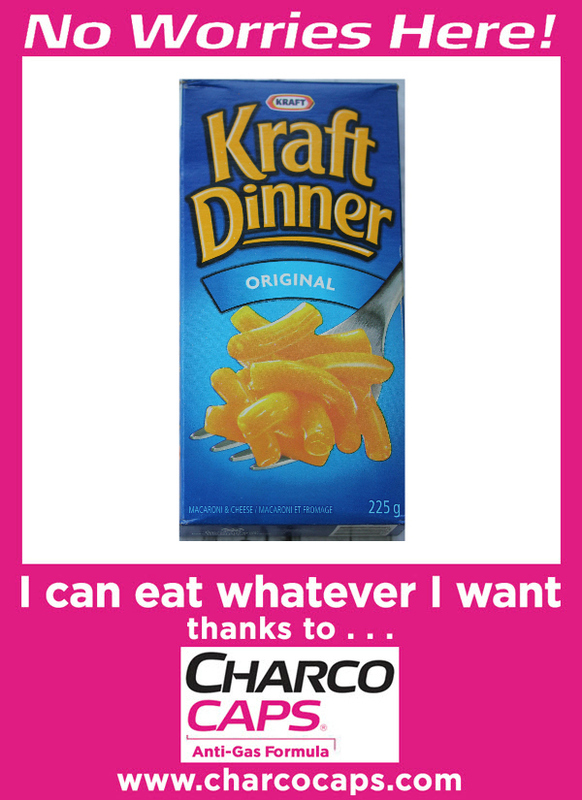 It lets you eat (and enjoy) your favourite foods without the constant worry of gas/bloating hitting at the worst times. Take two CharcoCaps® capsules either during or after eating a meal of high-gas producing foods OR at the first sign of discomfort. I was shocked at how well they worked. I’ve found a solution to my embarrassing issue. 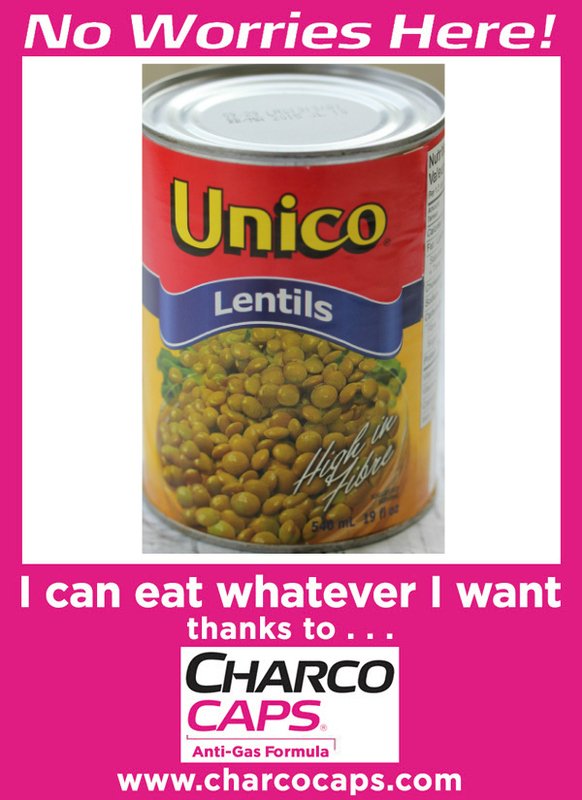 I tested them out with lentils and was amazed that I felt fine afterwards. I didn’t have to sleep on the couch- ha! I’m keeping a package in my purse to take whenever that old familiar feeling strikes. This way I’ll be ready and have a plan of action. CharcoCaps® Anti-Gas Formula is comes in both a 36-count blister pack and a 100-count bottle. You can find it in the antacid-gas section of Walmart, CVS, Walgreens and other major US retailers for a SRP of $9.49.